I was recently booked in to the Hyatt Ziva All Inclusive in Puerto Vallarta booked direct through the Hyatt website. The room rate was approx. $650 per night. This evening, I was casually browsing on Expedia and found that same room, room type and for the same dates availabel for $300 per night all in. Expedia was indicating that the room was 55% off as of tonight. This is a significant discount...how does Expedia manage to provide the same room for this price? Hotels have revenue management departments that seek to maximize profit for the hotel by selling rooms at different prices through different sales channels. The hotel may well have sold the room to Expedia for that price (actually, less than that price, since Expedia needs to take its commission) (or, as Tor-Einar Jarnbjo notes, Expedia could be taking a loss if they gave the hotel a guarantee). It's important to make sure the prices are exactly comparable. Sometimes rooms are significantly cheaper if they're 100% prepaid in advance (non-cancellable or stricter cancellation policy). There can also be differences in the room type, package offers (such as breakfast), and sometimes amenities (I've even seen a charge for WiFi if you don't book directly with the hotel). Many hotels, including Hyatt, have a best-rate guarantee program if you book directly through them. They'll match a lower price and give you a bit extra. The hotel would rather get your direct booking (and not have to pay a commission to the agency website). If you see a better deal online than what the hotel offers directly, it's usually worth contacting the hotel to see if they can match or beat it themselves. The last time I booked a room with a seemingly ridiculous discount rate from Expedia, I think it was around 85%, I asked the hotel manager how the hotel manages to operate with so low income. Expedia is likely to have different agreements with different hotels, but in this case the hotel was actually paid the normal price and Expedia was obviously trying to minimise their own loss. In this particular situation, Expedia managed a fixed number of rooms through their booking system and not only did they charge a commission for all successful bookings, but they also guaranteed a certain occupancy rate. If fewer rooms were sold, Expedia would still pay the hotel the full price (minus commission) for the vacant rooms. If all indicators seem to show that noone will book such a room, it may make sense to offer the room with a very high discount. If Expedia is e.g. paying the hotel 80€ in any case for a 100€ full price room and they have to offer it for 10€ to get it sold, they have at least minimised their anticipated loss by 10€. Expedia buys hotel rooms in bulk from many chains and many individual hotels. 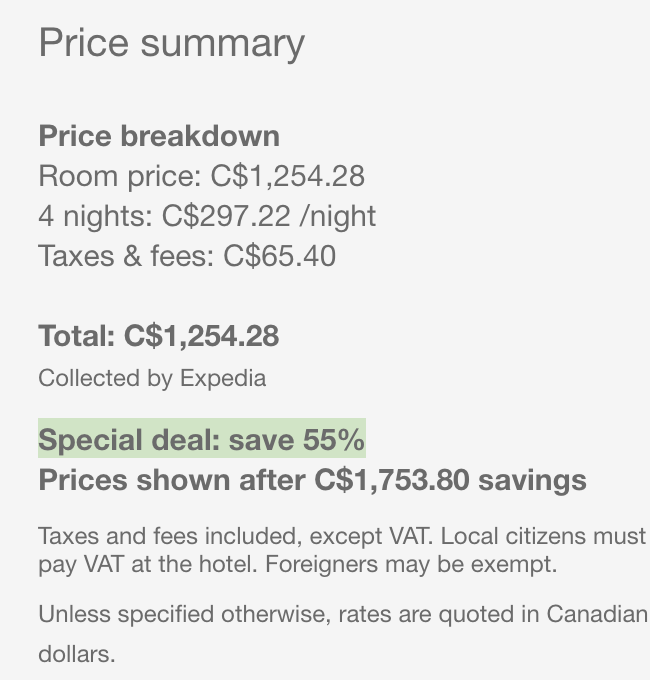 They get a good price from the hotel - a really good price - because the hotel gets guaranteed income for that room - and they can pass all or some of that price difference to you - but that means Expedia is on the hook to sell it. Everyone is trying to maximize revenue, and it works out in your favor, because a hotel room night, like an seat on a flight, has to be sold by a deadline or there's no money in it at all. BTW - they are truly buying rooms in bulk. Significant percentages of available room nights at some hotels. Another answer here is suggesting "If Expedia is e.g. paying the hotel 80€ in any case for a 100€ full price room". My guess is that's not right: You should think wholesale, not retail. This is called the "merchant model" and Expedia does a lot of it, though I don't think they release their numbers for how much business they do this way vs. other kinds of bookings. This article discusses various business models in the travel business including Expedia's. On the web you can see financial results from Expedia and analyst reports that suggest Expedia gets a very large percentage of their profit from hotels. They do cars and flights too of course but the profit there is much slimmer - especially for flights which is a totally cutthroat sector. But: people going on a trip usually need flight + hotel or flight + car + hotel. That means there's a lot of ways Expedia can make the whole package be really attractive to you - especially compared to what you get when you shop flight independently from car independently from hotel - while still taking in plenty of money. Expedia Group is an American global travel technology company. Its websites, which are primarily travel fare aggregators and travel metasearch engines, include CarRentals.com, CheapTickets, Expedia.com, HomeAway, Hotels.com, Hotwire.com, Orbitz, Travelocity, trivago, and Venere.com. If you rent a hotel room from any of these sites (and several others) it is from Expedia and it is coming out of their inventory of hotel rooms (if it is from a hotel they're buying rooms from). Other answers that point out that you can sometimes get a matching price from a hotel: that's true. And what's also true - in my experience, so anecdotal - is if you book directly with the hotel you can easily get a better room and certainly better service while you're there. So there's some trade-offs there that you can use if you're a more experienced traveler than I am! Just another thing that hasn't been mentioned: when you browse the hotel's own website, they are not competing with anyone else, at least at the same time -- you are already on their website, they only have to have a reasonable enough price. Through Expedia, customers will prefer the lowest price rooms, so hotels can't charge as much as they would otherwise. Not the answer you're looking for? Browse other questions tagged hotels travel-agents expedia or ask your own question. How much to haggle for a hotel room in India? What is the hotel room card slot inside the room for? Room with Kitchenette, Who Does the Dishes? How far in advance can you book a hotel room for an eclipse?